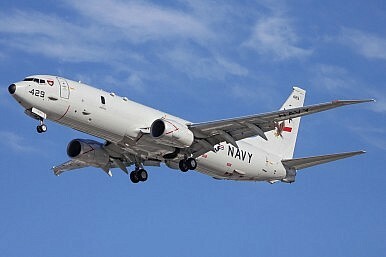 A U.S. P-8 Poseidon plane. The U.S. and China have different goals — and thus clashing approaches — for resolving the South China Sea issue. Since the 1990s, there have been three symbolic incidents between China and the United States that still spark disapproval in China: the 1993 Yinhe Incident (where the U.S. held a Chinese cargo ship at sea under accusations — later proven false — that it was carrying chemical weapons to Iran), the 1999 bombing of Chinese Embassy in Belgrade, and the 2001 Hainan or EP-3 incident in the South China Sea, where a collision between a U.S. EP-3 plane and a Chinese jet killed the Chinese pilot. Still, no major conflict or stand-off happened between these two great powers after these incidents, thanks to careful and skillful handling of the situation by both sides. Given this history, the most recent fly-over of the South China Sea by a U.S. P-8 surveillance plane made the Chinese uncomfortable. The truth is that although this time the U.S. acted rather dangerously in the Chinese view, similar patrols by U.S. ships and spy planes have been going on for decades. There is virtually no substantial difference between this latest patrol and countless others, although the situation probably will turn extremely dangerous should the United States actually decide to send warships and surveillance aircraft within 12 nautical miles of the disputed islands in the South China Sea without China’s permission. The Americans claim a legal right to conduct such surveillance, but the Chinese warn against it by describing such acts as irresponsible and dangerous, with the possibility of causing military misjudgments. So why do it? The line from Washington always involves “asserting freedom of navigation in the South China Sea,” which is less convincing when we remember that the United States itself has refused to ratify the United Nations Convention on the Law of the Sea (UNCLOS). From the U.S. perspective, irking China at this time may be a way to demonstrate Washington’s consolidated will to maintain its leadership in the region and to win trust from its traditional allies. And the recent publicity surrounding the latest flight also up the pressure on China for its recent moves in the South China Sea, testing China’s bottom line. On a grand strategic level, the United States sees the almost absolute freedom of navigation in international waters, including the South China Sea, as the cornerstone of U.S. global leadership. Washington thus has a self-appointed responsibility to intervene in regional disputes with firm determination. With such different grand visions of how to handle the problem, the United States and China have different strategies and tactics, and consequently very different stances on virtually every related issue. Given the current confrontational situation, both sides are in desperate need of the small but practical gestures that leave some leeway for each other. One such example: China’s suggestion that its newly-constructed facilities on South China Sea features could be opened to the international community, including the U.S., for civilian disaster response purposes. Unfortunately, these small gestures are left wanting on both sides. Americans in particular seem to have decided that whatever China does is wrong, simply because China is a large and powerful state. The major difference between grand visions of China and the United States may impede a reconciliation in the South China Sea, but careful and skillful handling of the current situation is especially crucial for both powers to find an “off-ramp” from escalating tensions. To quote Sun Tzu, “when you surround an army, leave an outlet free” (in Chinese, 围师必阙). Could the South China Sea Cause a China-US Military Conflict? It's in neither country's interests to have a conflict -- but they're headed in that direction all the same.